Valentine’s Day has come and gone, and with it we have seen many postings on social media of happy couples and their photos of lavish dinners and a renewal of their bonds of love. For the single, this day can be an unhappy reminder of love not there. One of the common questions I have been asked during my course of Paht Chee readings have been on this topic of love. We have those who have been in a relationship with their boyfriend for many years and yet still remain unmarried, and then we have those who are married, but to an unfaithful partner, or who has an unhappy marriage. Of course, we also have those who seem to have all the desired qualifications and yet are still single and unmarried. Recently over the Chinese New Year, a couple of very eligible ladies asked me about their marriage prospects, and for many of them, it really should not be a problem as it can be solved by activating their Peach Blossom star according to their astrology birth animal sign, then by going deeper energizing their inner Peach Blossom Earthly Branch animal sign which strengthens their general Peach Blossom… and also by correcting the Feng Shui of their home. 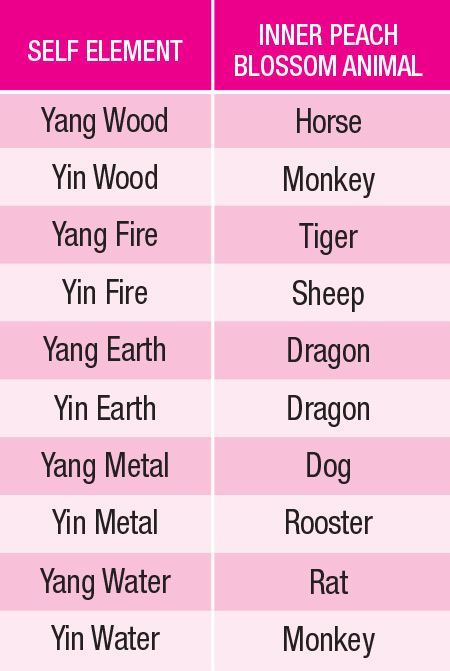 So for those who are single and wish to get married, I would recommend that you activate your Peach Blossom animal or animals by wearing a pendant of those animals. The figurine or pendant should be of a complete animal (not just the head or a 2 dimensional carving) which can be made from Stone or Metal. 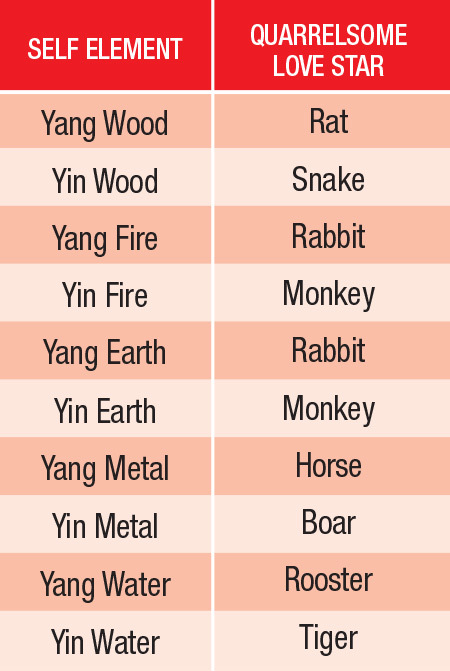 For investigating your Inner Peach Blossom, you will need to know your self-element (heavenly stem element in the Day Pillar) and then refer to the table below to locate your Inner Peach Blossom Animal. Then wear this with your general Peach Blossom Animal, which will be one of the cardinal animals – the Rooster, Rat, Rabbit or Horse. Of course if your chart already has the Inner Peach Blossom Star, and you are still having problems being attached or getting married, you will need to see if there are other problems that may be creating the obstacle or problem for you. The first thing I would do is to look at your bedroom. Your headboard must NEVER share the wall with the bathroom, even if it means you will be able to sleep facing your best direction. This mistake brings terrible relationship luck even to married couples if is done for a prolonged period of time and can even lead to a divorce. Next, your bed must be big enough for two people to sleep in, as sleeping on a single bed symbolically means that you will remain single. Look at your cupboard and the rest of your bedroom. There must always be some empty space, otherwise your life is filled with too many things, and not leaving any room for anyone else to join you. Of course, try tapping into your Nien Yen direction as well. If you have gone through all of these above exercises and found nothing wrong, perhaps the problem lies in your Paht Chee chart. This is where I introduce you the Quarrelsome Love Star and its effects on your love life. The Quarrelsome Love Star creates problems with relationships of the romantic kind. 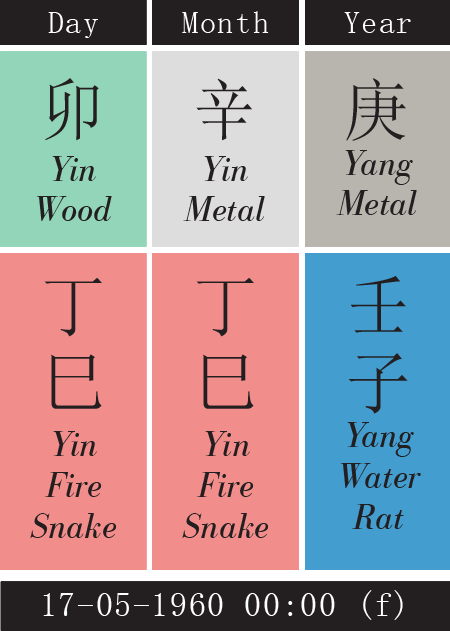 If you find this star appearing in your Year, Month or Hour Pillar, its effects are not so prominent and can be generally remedied by carrying your Peach Blossom Animal as well as by placing the 3 Harmony Animals on your bedside table. In addition, if there are clashes of elements in your heavenly stems or if you have a direct clash of animals between the Year and the Day pillar animals, additional remedies are needed. 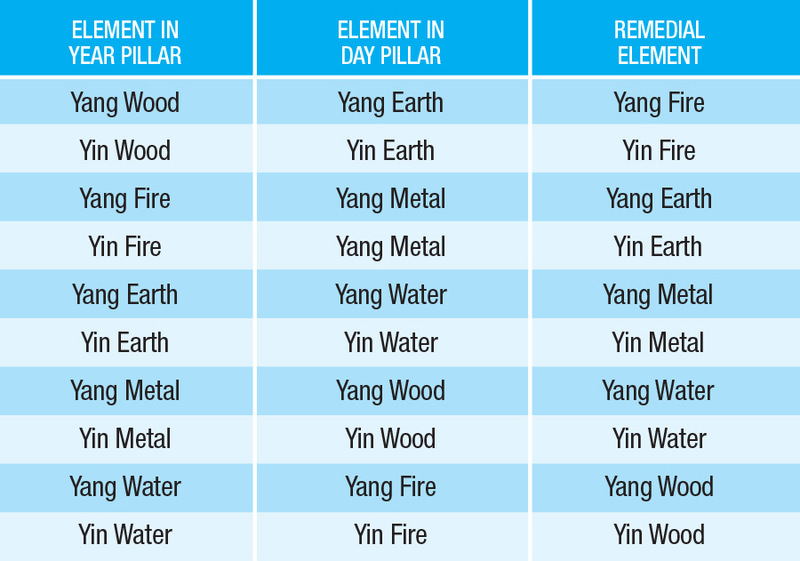 In the case of clashes in your heavenly stems, you will need to introduce the remedial element according to the table below. In the case of direct clashes in your Earth branch between the Year and Day Pillar – the remedy is to carry the Tai Sui Amulet keychain. Remember to replace the Amulet keychain every year around December. If the quarrelsome love star appears in your Day Pillar, this is when it at its worst, and brings serious problems to your romance luck and may even lead to divorce or separation. 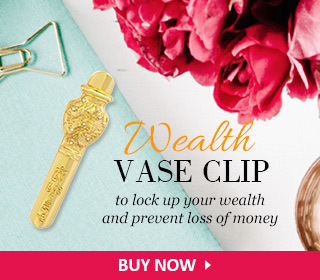 It also brings about 3rd party luck where your husband or lover may be unfaithful to you. The remedy for such a case is to use the Amethyst Geode cure. Place a piece of Natural Amethyst Geode tied with red string under your bed, directly underneath your feet. This client of mine has the Quarrelsome Love Star appearing as the Horse in her Year Pillar. 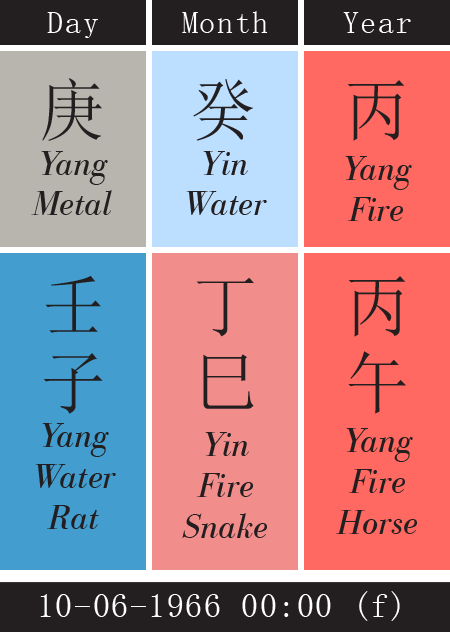 You also note that she has the Horse and Rat direct clash as well as the Yang Fire and Yang Metal clash in the heavenly stems. For her case, she has been with the same boyfriend for the past 20 years, and asking me if and when will they finally get married? 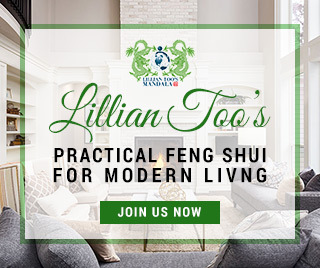 So for her case, she will need to carry the Tai Sui Amulet all through her life, and place the 3 Harmony Animals on her bedside table together with a piece of natural Quartz Crystal to introduce the needed Yang Earth element. Her Peach Blossom Animal is the Dog, and so either keeping a pet dog or by her wearing a pendant of the Dog figurine carved out of stone will be most helpful. For this client, she has the Quarrelsome Love Star appearing as the Snake in both the Day and Month Pillar. Fortunately, she does not have the clash in the heavenly stems or the direct clash in the earthly branch. In her case, she had no problem getting married, but she complains of an unhappy marriage where both parties are always arguing and recently, she discovered that the husband has been unfaithful to her all these years. While she remains married, she wants to know what can be done in order to improve her marriage luck. I suggested that she needs the Amethyst Geode cure and also to carry her Peach Blossom Animal – the Monkey in the form of a pendant made from gold, and to also display the 3 Harmony Animals on her bedside table.